Sliding Glass Door Digital Door Lock Deadbolt Tools - Buy It Now! Sliding Door/Pocket Door Hardware: Keyless Entry Combination Lock. Available in Antique Brass, Bright Brass and Satin Chrome. If you are looking for a stylish yet secure way to lock a pocket door or a sliding glass door off a patio deck, solarium, or clubhouse, this lock with keypad may be just what you need. This lock can be used on sliding door hardware , screen door hardware, patio door locks and hook locks. This keyless combination sliding door or pocket door lock is designed for a sliding door, a pocket door, a sliding gate, a door wall, or any sliding panel that needs a hook-type mechanism to secure and lock it. The hook of this combination lock rotates and catches on the strike plate or mortised jamb plate when the knob is turned to the locked position. Because the designs and finishes of these sliding glass door locks are so elegant, they are great for use in homes, apartments, and condos, and sturdy enough for use in commercial applications. This keyless combination digital door lock measures 1-5/8" by 5-1/2" . It fits virtually any door. It comes complete with everything you need including all mounting instructions, brackets, trim plates, and a choice of many strike plates to fit a number of different mortise or surface mounted applications. It installs in minutes, operates easily, and you can change the combination quickly. Using all our keyless digital locks is quick and easy. On the inside, this lock can be locked or unlocked by just turning the thumb turn. On the outside, you don't need the combination to lock this lock--just turn the knob. 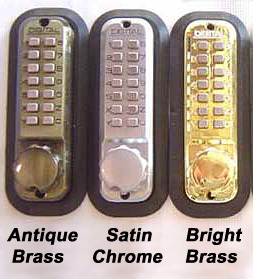 To unlock, simply type in your secret code on the keypad and turn the knob to retract the deadbolt. Are all these locks weatherproof? Yes, all our locks are completely weatherproof and can withstand all types of weather.